This product was added to our database on Monday 21 January 2008. 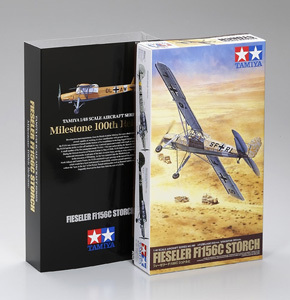 Highly-detailed 1/48 scale assembly kit model of the Fieseler Fi 156 Storch. Kit includes parts to replicate various versions of the Fi 156C, including fuel tank, skis, and 3 different types of canopies. Clear canopy sides have been molded together with the fuselage halves for more realistic construction. Important structural sections such as the wing spar and the landing gear struts are made from metal parts for enhanced realism and strength. Includes 1 pilot and 1 commander figure. Precision photo-etched parts such as cockpit panels, cockpit frame, and front seat also included.